« Missouri vs. Nebraska: It’s college football game day! …there was no $3.8 million scoreboard with special effects, no blaring music, no ads and not even a public address system. Even the play clock was out, and referees resorted to hand signals. There was only The Game; the players and a marching band. Actually, two marching bands, which competed against each other pretty much the whole game because no one could come on the PA to stop them. A Golden Girl during the pre-game show. But wait. It’s been raining all day, and it’s going to keep raining. Whatever. This is my job and my assignment, and nothing can stop me from doing good work. …Except, I really need to take care of all the expensive equipment I’ve borrowed. Okay, I got this. 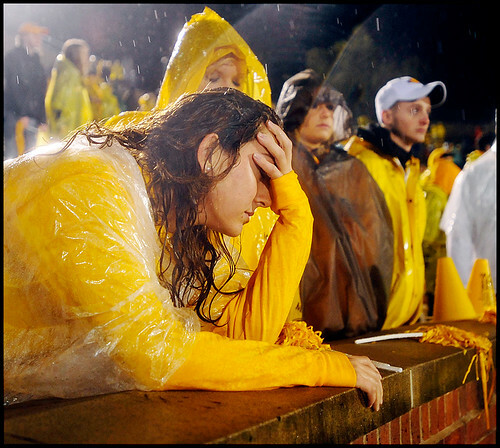 I’m going to stop worrying, and no matter how soaked I get, I’m going to get the best football photos I’ve ever shot. So I stopped worrying. And I got the best football photos I’ve ever shot. Missouri senior linebacker Sean Weatherspoon tackles Nebraska junior quarterback Zac Lee during the first quarter of the game. Nebraska junior quarterback Zac Lee fumbles during the first quarter of the game. 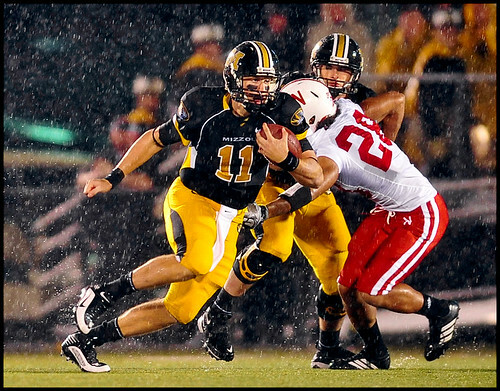 Missouri sophomore linebacker Will Ebner tackles Nebraska junior quarterback Zac Lee during the third quarter. Missouri sophomore linebacker Will Ebner tries to break Nebraska junior quarterback Zac Lee's pass during the fourth quarter. Nebraska sophomore quarterback Alfonzo Dennard breaks up a pass intended for Missouri senior wide receiver Danario Alexander in the third quarter. Missouri senior defensive end Brian Coulter lunges after Nebraska junior running back Roy Helu Jr. during the fourth quarter. Last month, when I walked off the field after shooting the Illinois game, I was not confident that I’d gotten enough shots, annoyed with the crude fans and generally discouraged. Two nights ago, when I walked off the field after shooting the Nebraska game, I was soaked to the skin, pretty muddy after I’d fallen to get some fans’ names and worried about how all the borrowed equipment had held up in the rain. But despite all that, and more importantly, I felt good. I knew I’d gotten better shots than before, and I’d done it under some of the most daunting circumstances I can expect to face. Brady Koch and Shawn Hoover celebrate Nebraska's touchdown spree during the fourth quarter. 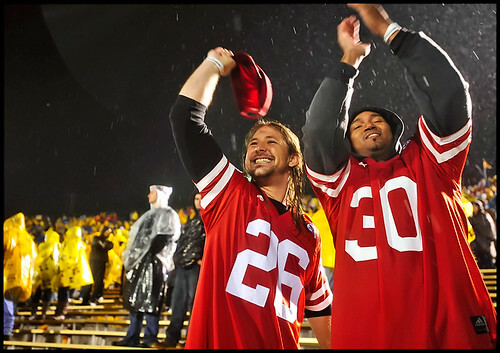 Koch and Hoover are both MU students but, as native Nebraskans, cheered on the Huskers. As always, you are entirely welcome to view more photos. Those are great shots, the rain totally added to the effect!! I can’t lie — it was a little miserable to shoot, but the rain definitely adds a nice touch to the photos. Thanks for reading! Nice captures, for sure. One question, though: why the strange aspect ratio? Thus marks perhaps the first time ever that I’ve misspelled my own name. Haha I was wondering about that. You asked, “why the strange aspect ratio?” I was using a D700 and D3, whose aspect ratios are 2:3, but I cropped in at least a little for almost every photo. Let me know if you’re wondering why I cropped any particular photo a certain way! I love your shirt grab shot. Great job! Great work, especially considering the working conditions.